Brazeau County is located to the west of Drayton Valley, Alberta about 150 kilometers southwest of Edmonton, in the heart of oil and gas country. On the western edge of the county sits the Brazeau Dam and a 355 megwatt hydro power plant, which has an unusual feature, a pumping system to put water back above the dam to recharge the reservoir. The economic engine of Brazeau is oil and gas, forestry, agriculture and tourism. The beautiful Pembina River carves its way through the forests as does the North Saskatchewan. We are here not to talk about the price of oil or the woes of softwood trade policies, but for the Brazeau County Solar celebration event. “What we’re doing is showcasing our solar initiative,” says Guyon as he greets me at the county office. In 2016 Brazeau County adopted the Climate Energy and Climate Action Plan and then started looking for new opportunities. “We took a look at it and we saw the instability of the whole electrical industry and who is providing power. We saw that the governments were looking at starting the carbon tax so we just thought we’d try something that might be able to help stabilize our energy costs,” says Guyon. 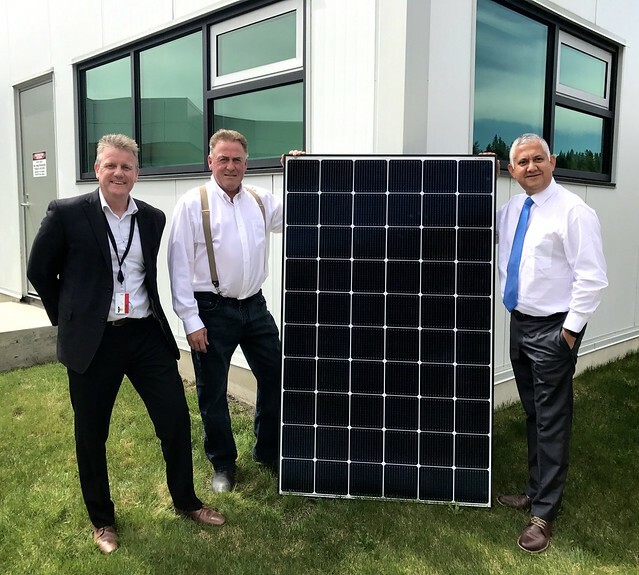 Brazeau County started looking a solar energy, working with Jason Atkinson of ENMAX and they have since installed 900 solar modules on county buildings. Guyon says the county has looked at numerous alternative energy strategies such as hydro, run-of-river and wind as well as combined heat and power, a more efficient way of using natural gas. “We’re clearly an oil and gas town, that’s what fuels this county, we’ve got forestry and they are a significant contributor to jobs and we’ve got agriculture and tourism, but clearly it’s oil and gas – what we are trying to do is take a look at the different opportunities with alternative energy regardless of how efficient we are at producing our hydrocarbons the world is moving to alternative energy and we need to be part of that program,” say Guyon. It’s a forward looking strategy that Guyon says will serve residents and the county well. He’s so impressed with the potential of solar that Guyon has installed a couple of impressive solar arrays totaling 40 kilowatts on Quonset’s on two of his own ranches. “To date since January I’ve generated 15 megawatts of power which equates to 800 or 900 dollar savings already and that’s just in the winter months, so I’m really excited to see how it will perform over the summer and for the next 25-30 years,” says Guyon. “If you put your money where your mouth is and you have money invested, you clearly want to watch it and see how it’s going to perform. If it works out good I’m going to tell everybody, if it doesn’t work out, well, we’ll cancel this interview,” chuckles Guyon. Rural counties and rural folks alike relish in spirit of independence and solar appears to fuel that spirit and serve as a hedge against increasing energy costs, carbon levies and as a new source of energy in an increasingly carbon constrained world.